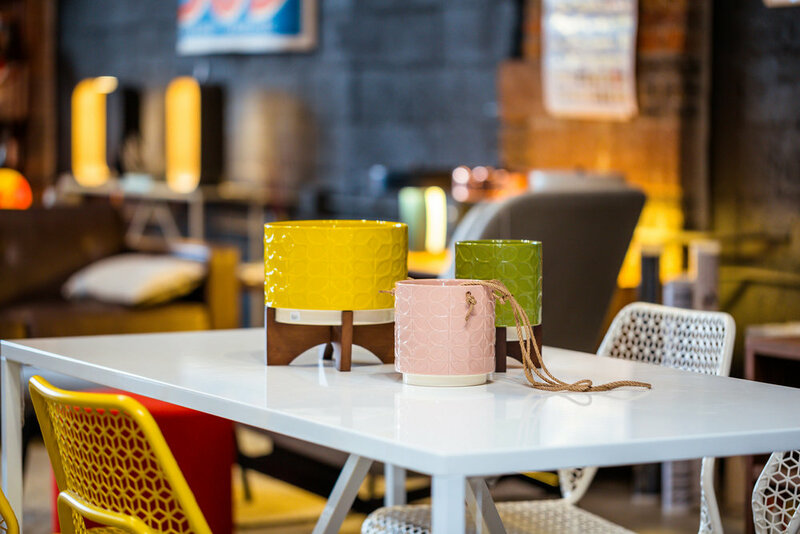 Mod Livin' Furniture features affordable mid-century classics, modern lighting, modern chairs and sofas, modern storage and contemporary accessories. Serving the Denver/ Boulder region, some of the premier manufacturers represented include Blu Dot, Gus Modern, Vitra, Bensen, Modernica and Areaware. Mod Livin' opened its doors in the Summer of 2001, with the goal of providing the residents of the Rocky Mountain region with a premier outlet for mid-century new and vintage furniture and accessories. Mod Livin's first location in the historic Park Hill neighborhood in Denver has grown to fill the building's 10,000 sq ft of space with 3 separate and distinct showrooms under one roof. Our selection of vintage items covers a broad selection of price points to accommodate every budget, from the college student to the most selective designer. Mod Livin's 2nd location inside the Modern Nomad warehouse, brings a curated selection of some of today's finest modern designers to RiNO. Mod Livin' Rino will bring a level of design and style to Denver's already eclectic mix of architecture and spaces. Offering design services and unparalleled customer service, Mod Livin is thrilled to be a part of the evolving and energetic RiNO neighborhood. Mod livin' has also enjoyed working in tandem on projects for the Denver University School of Film, the Art Institute of Colorado, and the Westwood Design Collaborative. Through these and other contacts, we have branched out to participate in such media productions as Design on a Dime, Extreme Makeover/Home Edition and MTV's Real World.